The Clayton range made from 100% real leather features flat, wide armrests that highlight this range's modern look. 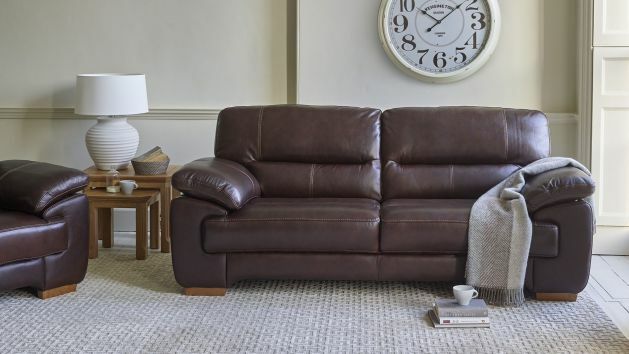 The Clayton leather sofa range features a classic design, providing you stylish and sumptuous seating in your living room. Clayton boasts touches of both modern and traditional design, so it looks great in any home style. Plus, with several great colours of real leather to choose from, you can find your ideal look today. The range features bold flat wide armrests, which add a contemporary flair to each piece. It's packed with all the high quality details that our furniture is known for, including integral hardwood in the frame, and screwed, glued, and pinned joints for incredible strength and durability with no creaking, warping, and bowing over time. The seats are pocket sprung and topped with layers of foam and fibre, for a comfortable seat that keeps the leather looking its best with no puddling. Shop all our great Clayton pieces today, and don't forget about our great free delivery options, straight to the room of your choice as standard!